Mid-week cooking is a faff isn’t it? I say that and I don’t even have kids / a dog / co-habiter (tick as apply) to feed. They say living on your own is easier. You’ve got less washing up to do, less stuff lying around and you can get away without hoovering for DAYS because no one is around to judge you. All in all, I do like it but the cooking bit can be a faff, particularly when I’m knackered and it’s late and I have Nashville lined up on Sky+. These days I’m becoming much more reliant on cheese on toast for my dinner than I’ve ever been. If PhDs were just a little easier and took up a fraction less time then I wouldn’t have a problem really. I do try really hard to prepare something warm, nutritionally balanced and which requires the use of utensils for my dinner during the week. But what I don’t want, and I’m sure many of you can relate, is to spend upwards of half an hour preparing my dinner. 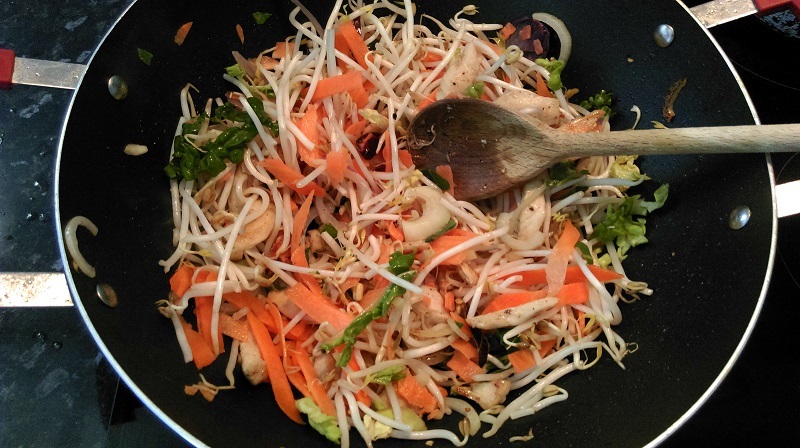 It’s not exactly new knowledge that the stir fry is a good go-to option for a midweek meal. It’s quick to cook ans it’s a useful meal for clearing out your fridge and using up all those bits & pieces which don’t quite make up a meal. This is single / student cooking at it’s best. I’ve listed some suggestions for the vegetable side of the stir fry, namely a bag of stir fry veg, but feel free to play around with this and add whatever you have lying around. Mushrooms, cabbage, onion, pepper etc. Equally, play around with the sauce too. A friend of mine adds a little honey to hers and it really works. Once you’ve made this a few times it will become less of a recipe and more of an loose idea to work around. This will serve 2 greedy portions or 3-4 moderate portions. If you are reducing the portion size (to serve just yourself) then keep the sauce quantities the same and reduce the chicken & veg. If you are feeding more people, then double the sauce, chicken and veg quantities. Make it Vegan or Veggie: Replace the chicken with cubes of tofu, doused in soy sauce, and fry until crisp. Or skip the meat altogether and add some toasted peanuts to increase the protein content. Start with the rice. Measure 1 cup of basmati rice into a sieve and rinse under cold running water until the water runs clear. Add the rinsed rice to a pot & add 1 & 1/2 cups of cold water. Do not stir the rice. Cook the rice over a high heat until it starts to bubble then immediately reduce to a low heat to simmer. Put the lid on the pot & leave it alone for 10 mins. Don’t stir, don’t reduce the heat and don’t lift the lid. But don’t worry, the rice won’t burn. Now heat a wok or frying pan over a high heat while you slice the chicken into small thin strips. Add 1 tbsp of rapeseed or olive oil to the wok & a splash of sesame oil. Since sesame oil has a low smoking point, we can’t fry with it alone because it will burn and taste awful. By adding sesame oil to regular cooking oil you get all the flavour without the burning. 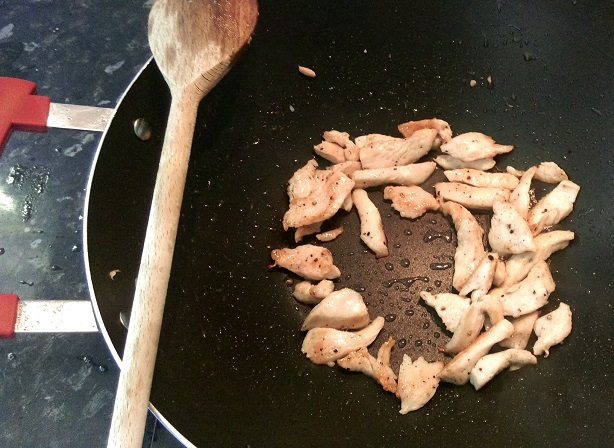 Toss the chicken strips into the wok and season with salt & pepper. Cook on a high heat for 5-6 mins until browned. While the chicken is cooking, prepare the sauce. Mix the soy sauce, sweet Thai chilli sauce & peanut butter together in a small bowl with crushed or finely chopped garlic cloves. Mix well. Once the rice has had its 10 minutes, remove from the heat & rest the pot on a damp cloth. Do not remove the lid or stir the rice. Now add any other vegetables you want to the wok. 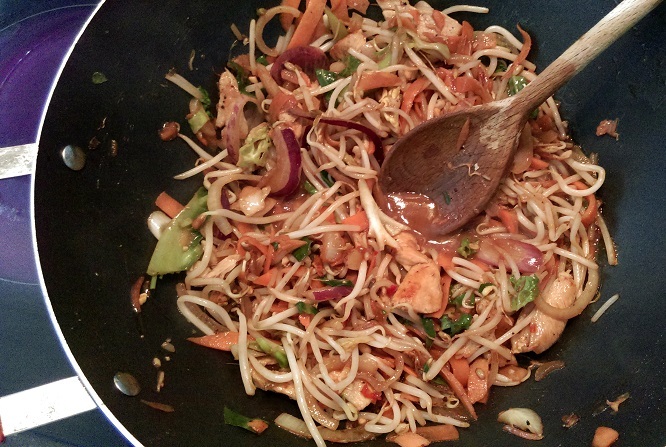 Cook for 1-2 mins on a high heat then toss in a bag of stir fry veg. Cook for 60-90 seconds, stirring constantly. Spoon the satay sauce into the wok & add a generous glug of soy sauce. Stir then remove from the heat. 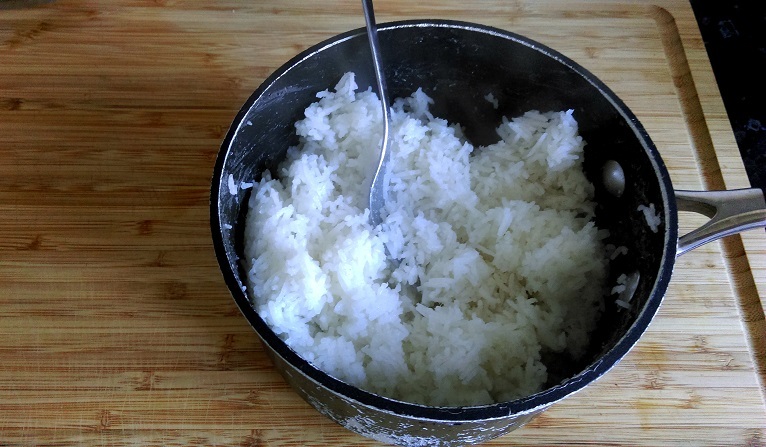 Now remove the lid from the rice & fluff it up with a fork to separate the grains. Spoon the rice into a shallow bowl with the satay beside it. 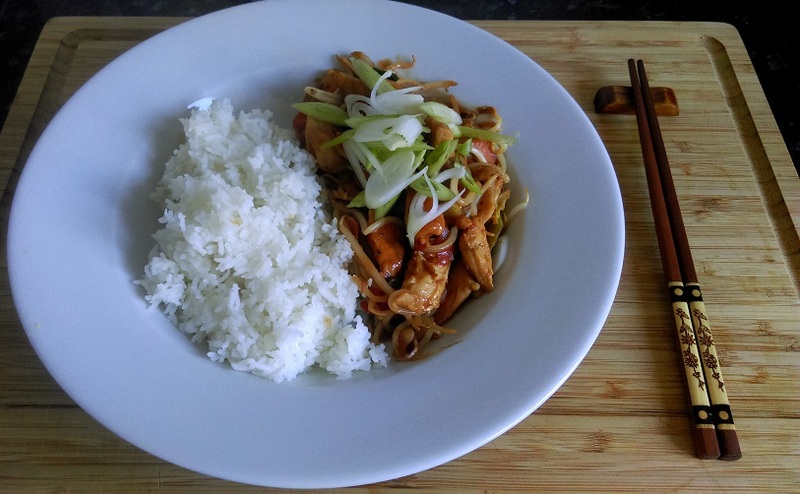 Spoon the satay sauce over the top and serve with a little shredded spring onion. What’s your go to mid-week meals? 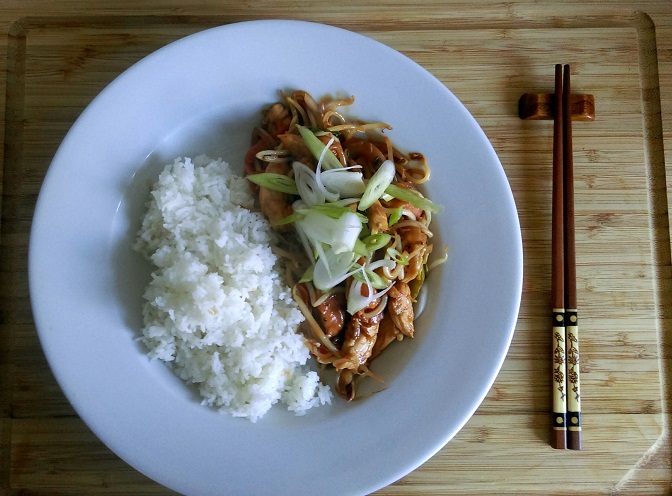 Do you have a handy repertoire of easy / fast meals? Or do you secretly munch on Pot Noodles and crisp sandwiches? Let me know!